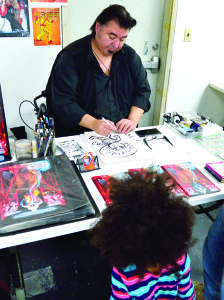 Local comic book artist and creator Greg Giordano compltetes a caricature of Anaia Daoust (3) at the opening of Killer Rabbit Comics and Games at the Taft Corners shopping center on Saturday the 19th. 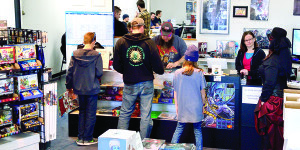 Mark Stair and Jennifer Garrett (behind the counter) opened Killer Rabbit Comics and Games in the Taft Corners shopping plaza on Saturday the 19th. The store not only offers new comics including locally producted books and games, but also has collectibles including vintage comics for those trying to complete a collection.